(Nanowerk News) The Society of Nuclear Medicine (SNM)’s Nanomedicine and Molecular Imaging Summit wrapped up today in Albuquerque, N.M., with in-depth discussion—and a high sense of energy looking ahead. Nanotechnology is a quickly growing, but still evolving field with nearly limitless possibilities for applying technology in highly targeted ways. For the medical community, nanotechnology involves using nanoparticles to target disease—and treat many common and devastating diseases before they spread. Concomitantly, molecular imaging can be used to assess the health and environmental impacts of nanomaterials. 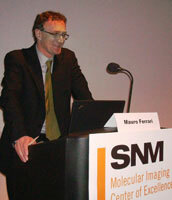 Dr. Mauro Ferrari gives the keynote address at today's summit. Nanotechnology: Providing a Regulatory Framework in the U.S.
As part of the summit, advisors from the U.S. Food and Drug Administration (FDA) provided a regulatory framework for developing nanotechnology and targeted radiopharmaceuticals. “FDA is pleased to work with SNM, physicians and other members of the molecular imaging community on the critical field of nanotechnology, which is evolving at a rapid pace as new technologies make these developments possible,” said Wendy Sanhai, Ph.D., senior scientific advisor at FDA. Working in concert with SNM and other stakeholders, FDA is seeking to educate imaging physicians, researchers and other stakeholders about the regulatory requirements for novel techniques and regulatory pathways. Dr. Sanhai’s discussion, presented at a session on regulatory considerations, focused on ways to advance the science of nanotechnology. Lori Sheremeta, LL.M., a lawyer and research officer at the National Research Council’s National Institute for Nanotechnology at the University of Alberta, Edmonton, Canada, and special advisor to Alberta Innovates–Technology Futures, discussed regulatory and public policy challenges regarding nanomaterials in the face of scientific uncertainty. At another session, John V. Frangioni, M.D., Ph.D., associate professor of medicine and radiology, and Hak Soo Choi, Ph.D., instructor in medicine at Harvard Medical School’s Beth Israel Deaconess Medical Center, spoke about design considerations for nanoparticles that interact with the body. Dr. Frangioni and Dr. Choi’s presentations reviewed recent developments in the field and discussed how this new understanding of nanoparticles might guide future studies in air pollution, drug delivery and carcinogenesis. King Li, M.D, M.B.A., chair of the department of radiology at the Methodist Hospital Research Institute, spoke at a third session that gave participants the opportunity to discuss in-depth how nanotechnology can be used to diagnose and treat disease. As the field of nanotechnology continues to develop, medical imaging will play a key role in better understanding how nanoparticles can be used to precisely target and treat the biological underpinnings of cancer, neurological conditions and cardiovascular disease. The summit explored ways in which molecular imaging and therapy currently use nanotechnology, as well as how these methods can facilitate advancements in the understanding and proper management of nanomaterials both for the environment and human health. This was SNM’s fourth annual molecular imaging summit, but the first program dedicated to examining the potential of nanomedicine. Looking ahead, SNM will continue to work with imaging researchers, physicians, regulatory groups and other members of the molecular imaging and nuclear medicine communities to bring highly targeted therapies from the bench to bedside.